In seventeenth century England, broadside ballads were everywhere. Walk into an alehouse and you would see sheets pasted to the walls—the woodcuts of lords and ladies, shepherds, milkmaids, murderers, lovers, and even murderous lovers vying for your attention. Walk the streets of London and you would see the sheets held up by ballad mongers, with heavily inked black-letter type, waiting to be bought. But you would not just see broadside ballads on walls or in hands, you would also hear them. They were sung in groups in the alehouse, sung individually by a ballad monger, sung at work by apprentice and master, sung in the fields by milkmaids and farmers. Printed with the names of familiar tunes to which they could be sung, broadside ballads were more than art, more than text, and more than song. They were, in a sense, promiscuous—available to all and used in all kinds of ways. Thus broadside ballads really were everywhere. This archive presents the broadside ballad in its heyday in England of the seventeenth century, both as textual and visual artifact and as song. But although the heyday of the broadside ballad was the seventeenth century, its story stretches backward and forward far beyond that century. Broadside ballads survive from the early sixteenth century right through the nineteenth century.1 Over these more than three hundred years the look and role of broadside ballads changed. Furthermore, as scholars became interested in ballads in the eighteenth and nineteenth centuries the very definition of the term ballad became a subject of debate, and often these debates exclude the broadside ballad. In order to place the ballads in this archive in both a scholarly and historical context, this essay will briefly summarize the various definitions of “ballad” and lay out the material development of the broadside ballad. The ballad traditionally has been defined broadly as a "story in song"; however, for many scholars that definition is still too narrow, since it does not account for those ballads which are not narrative in nature or which were not sung. One way of circumventing this narrow definition has been to label ballads as of different kinds: the traditional ballad, the broadside ballad (the focus of this archive), and the literary ballad. The “traditional” ballad is generally defined as a ballad that has passed orally from generation to generation. Often the topics were of ancient battles, knights and ladies, ghosts (particularly the ghosts of lovers), forced marriage, spurned love, and Robin Hood. For many early scholars of ballads and folklore, including the famous Francis James Child, the oral transmission of traditional ballads implied that they possessed unique qualities of the people, or folk. They were examples of the virtues of untutored nature versus the artificiality of art. Thus for scholars interested in traditional ballads, the most valued ballads are those that have had minimal crossovers into text (or ideally, but rarely achievable, none at all). There is less controversy about the category called "literary" ballads. These are poems that are written in imitation of ballads. Generally they are intended to be purely poetry (as opposed to being songs as well). Works such as Wordsworth and Coleridge’s Lyrical Ballads are representative of these kinds of ballads. The model of ballad that Wordsworth and Coleridge evoke, however, is centered in the idea of the traditional ballad. When Wordsworth describes the subject of his poetry as “incidents and situations from common life” written in the “language really used by men” he is drawing on the idea of a traditional, oral ballad.3 Understanding these terms is important to understanding the scholarship on ballads, but it must be stressed that for contemporaries the term “ballad” could denote any of these forms. Regardless of how scholars choose to categorize them, broadside ballads have been extremely important in the history of British culture. A significant amount of the literature printed in the sixteenth and seventeenth century fits into this category. During that time thousands of broadside ballads were printed and likely millions of copies circulated.4 There were more copies of ballads in circulation than just about any other kind of printed work. Despite their ubiquity, however, only a small sample of sixteenth century broadside ballads survives today: approximately 280, and this includes multiple copies of some. The sixteenth century broadside ballads were generally printed in black-letter type (what we know today as “gothic”), sometimes with ornamental borders and a line of ornament separating the columns of verse. Few were printed with woodcuts or tune names. These latter features, so familiar during the seventeenth century, only began to appear regularly in the last decade of the sixteenth century and the first decade of the seventeenth, and it was not until the 1620s that they became standard. By the 1620s one format had become dominant: ballads in two parts printed on a folio sheet (a large sheet of paper), with illustrative woodcuts, tune names, and black-letter type. The persistence of black-letter type is noteworthy because roman type had become the norm for most kinds of printing several decades earlier (see essay on Black Letter). Broadside ballads retain this anachronistic typeface until very late in the seventeenth century. The woodcuts were often stock illustrations that were not directly related to the ballad that they adorned, though like all things pertaining to broadside ballads, there are exceptions (see woodcuts essay). Another change in the broadside ballad format occurred in the 1650s. It was shortened to one part so that two separate ballads could be printed on one folio sheet, which would then be cut in half and the two ballads sold individually. Examples of the ballad format between the 1620s and 1650s are found in Volume 1 of Pepys’s collection. Examples of the format after the 1650s changes are found primarily in Volumes 2, 3, and 4. Close to the turn of the eighteenth century ballad printers and publishers began to abandon black-letter type in favor of roman type, often called white letter. Sometimes they also replaced woodcut illustrations with staves of music, though often such notes made musical nonsense. Claude M. Simpson asserts that the inclusion of music on ballads is related to the popularity of stage songs, which if successful in the theater found their way onto broadsides.5 Though that may be the case, many of these late seventeenth-century ballads were printed without musical notation. Ornamental borders reappeared while woodcuts were often omitted, making these ballads visually similar in some respects to those of the sixteenth century. In the introductory note to his collection of ballads, Pepys speculates that these changes were done “for cheapness sake.” Volume 5 collects many examples of this late seventeenth-century format. 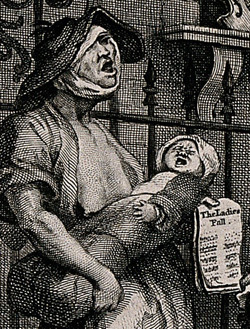 Remarking on the sensed diminishment of the broadside ballad, Cyprian Blagden argues that the ballad and the partnerships centered on its production and distribution “guttered out in the stronger light of the eighteenth-century chap-book.”6 According to this account, the broadside ballad could not keep up with other, newer, forms of cheap print. The reality, however, is that ballads continued to be printed through to the nineteenth century. But at the same time their formats continued to change, making them markedly different from the broadside ballads of Pepys’s collection. Ballads began to be printed in even smaller sizes, and often many small ballads would be printed on a single folio sheet (about four to five per sheet), from which the printer cut them. These mere slips of ballads were called, appropriately, “slipsongs.” With the invention of the cylindrical press, slipsongs could be printed in large numbers on sheets of paper as much as several feet in length. When a customer wanted a ballad or two, the seller simply cut them off the sheet. 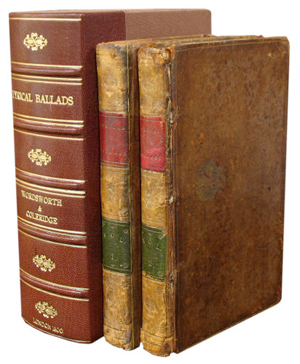 Regardless of the particular format, ballads endured for over three hundred years. And though they are no longer produced in any significant number, through the efforts of collectors like Samuel Pepys and the work of archivists like those of EBBA, they will continue to endure in yet another innovative format. 1 Broadside ballads are produced even today; however, they are no longer produced or distributed on the mass scale they once were. Most people are unaware of their continued existence, and so their cultural reach is extremely limited. 2 Adam Fox, Oral and Literate Culture in England, 1500-1700 (Oxford: Oxford University Press, 2000); Robert S. Thomson, "The Development of the Broadside Ballad Trade and Its Influence upon the Transmission of English Folksongs" (unpublished Ph.D. diss., University of Cambridge, 1974). 3 William Wordsworth, "Preface to Lyrical Ballads," in The Critical Tradition: Classic Texts and Contemporary Trends, ed. David H. Richter (Boston: Bedford, 1998), 303. 4 Tessa Watt, Cheap Print and Popular Piety, 1550-1640 (Cambridge: Cambridge University Press, 1991), 11. 5 Claude M. Simpson, The British Broadside Ballad and Its Music (New Brunswick, NJ: Rutgers, 1966), xii. 6 Cyprian Blagden, "Notes on the Ballad Market in the Second Half of the Seventeenth Century" Studies in Bibliography 6 (1953-4): 179. Blagden, Cyprian. "Notes on the Ballad Market in the Second Half of the Seventeenth Century." Studies in Bibliography 6 (1953-4): 161-80. Cheesman, Tom, and Sigrid Rieuwerts, eds. Ballads into Books: The Legacies of Francis James Child. Bern: Peter Lange, 1997. Dugaw, Dianne. "The Popular Marketing of 'Old Ballads': The Ballad Revival and Eighteenth-Century Antiquarianism Reconsidered." Eighteenth-Century Studies 21.1 (1987): 71-90. Franklin, Alexandra. "The Art of Illustration in Bodleian Broadside Ballads Before 1820." Bodleian Library Record 17.5 (2002): 327-52. Livingston, Carole Rose. British Broadside Ballads of the Sixteenth Century: A Catalogue of the Extant Sheets and an Essay. New York: Garland, 1991. McNeill, Fiona. "Ballads." In Oxford Encyclopedia of British Literature, ed. David Scott Kastan. Oxford: Oxford University Press, 2006. Rollins, Hyder E. "The Black-Letter Broadside Ballad." PMLA 34.2 (1919): 258-339. Simpson, Claude M. The British Broadside Ballad and Its Music. New Brunswick, NJ: Rutgers, 1966. Spufford, Margaret. Small Books and Pleasant Histories: Popular Fiction and its Readership in Seventeenth-Century England. Cambridge, UK: Cambridge University Press, 1981. Thomson, Robert S. "The Development of the Broadside Ballad Trade and Its Influence Upon the Transmission of English Folksongs." Ph. D. diss., University of Cambridge, 1974. Wordsworth, William. "Preface to Lyrical Ballads." In The Critical Tradition: Classic Texts and Contemporary Trends, ed. David H. Richter. Boston: Bedford, 1998. 302-14. Wurzbach, Natascha. The Rise of the English Street Ballad, 1550-1650. 1981. Trans. Gayna Walls. Cambridge: Cambridge University Press, 1990.